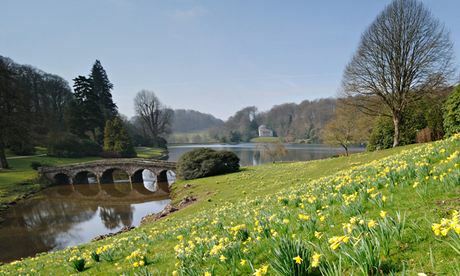 There is always a sense of expectation when you take first-time visitors to Stourhead and down the winding path towards the spot where they stop and stare in sheer wonder, past the Palladian Bridge and the sheet of water fringed by temples, at the Pantheon framed in that perfectly contrived classical landscape. But this time, our attention was caught long before. The yard of the Spread Eagle Inn, close to Stourton church on the Stourhead estate, is a place where people often gather, and maybe sit down for a rest, a chat and an ice-cream after their walk. This time there were musicians with mandolin and drum, and a circle of cheerful children, some very small, all in period dress and garlanded with flowers (they might have been extras in a Jane Austen dramatisation), vigorously dancing a round, supported by smiling parents and friends clapping and stamping in time to the drum. You could not fail to catch the rhythm, and delight in the joyful energy of the scene. This, we discovered, was a group called Steps in Time, children between the ages of three and 16 from Shaftesbury and the Dorset villages thereabouts. They perform traditional country dances, some native to their district, from across the ages. Sometimes they act mummers plays, and they learn about the folk traditions their performances spring from. You might see them at local fetes and country shows but they have been filmed too. When we saw them, they were rattling the tin (and getting a good response) to support a trip to a festival in Poland. We returned an hour or two later, to find the atmosphere enhanced by two accordions, and by laughing adults and friends whirling round with the children, some happily improvising. And no one was reaching for a phone to check their emails.